Concord Hospitality Enterprises is an amazing company to work for and offers the following benefits: health insurance, PTO/Vacation, 401k (after a year of employment), free nights at other Concord properties and much more. Click on the link for further details! Do you have a passion for fashion? Do you love surrounding yourself with positive and outgoing people? Well NOW is your chance! Come be part of an incredible family and represent a brand that you can feel passionate about. With strong core values and a belief that we exist as a brand to celebrate and support all WOMEN! Remember how we said now is your chance? 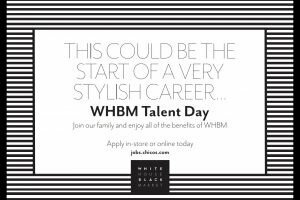 White House Black Market at Legacy Village is hosting a Talent Day March 26th! But don’t wait till then..get a jump start by clicking here. Wild Mango is now hiring for their upcoming opening at Legacy Village! Apply Now or stop in our store. Your upbeat attitude and ability to engage customers keeps the sales floor energized and Sales Associates motivated. Under the direction of the Assistant Store Manager, Sales you lead your team to meet daily sales goals—and exceed customer expectations. With a constant eye on the sales floor, you adjust staffing as needed to be sure every customer gets personal attention. You’re a mentor. You coach and develop creative ways to encourage your team to meet sales goals and turn out a top-notch performance every day. You provide productive feedback and thoughtful guidance to Sales Associates, grooming them for advancement on the sales team. Apply Design Expert or stop in our store.